People wanting basic advice about stocks, bonds, mutual funds, retirement planning, and tax strategies may find that picking a good book seems as daunting as deciding what to do with their savings and investments. 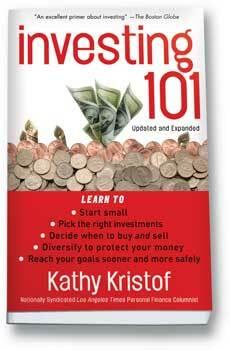 Investing 101: Updated and Expanded can help you get on a path that you can understand and stick with. Author Kathy Kristof, a Los Angeles Times consumer reporter, takes the mystery and anxiety out of investing by keeping choices manageable. She walks readers through the investment cycle and the ways they can think about their financial lives, rather than presenting stand-alone concepts like stocks and real estate. This expanded edition has new information about 529 college savings plans, annuities, Roth IRAs, reverse mortgages, and why declining markets can be good for you. It includes a cautionary look at home mortgages as investments. There’s even a portfolio for the "lazy investor." Kristof is known for her weekly syndicated personal finance column, which reaches 40 million readers online through more than fifty major newspapers. Cited as “maybe the best reporter of all the personal finance columnists" in the TJFR 1999 Blue Chip Newsroom ranking of the top 100 American business journalists, she has received numerous writing awards and honors, including the title of 1998 Consumer Advocate of the Year by the California Alliance for Consumer Education. She is a sought-after speaker for investment conferences and appears regularly on radio and television news programs. Kathy lives in Los Angeles with her two children.